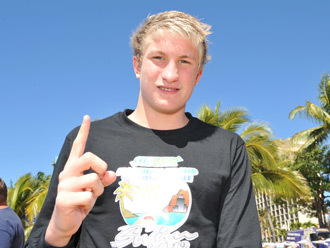 YOUNG super fish Joshua Parrish defied chilly water and blustery conditions to emerge as the comprehensive winner of yesterday's Magnetic Island to Townsville Swim. The 15-year-old Gardens Swimming Club member finished the 8km course in one hour, 42 minutes and 42 seconds - more than four minutes ahead of second-placed getter Matt Pegg, who crossed the line in 1:46.56 secs. Swimming what he considered to be the toughest race of his life to date, Parrish said the challenging conditions pushed him to the limit both physically and mentally. "The last two kilometres were the longest of my life, I just had to push through it," he said. Fellow Gardens swimmer Courtney Hayward, 16, crossed first in the women's category with a time of 1:48.18 secs and finished third overall after a limited preparation. "I hadn't done much training so I surprised myself quite a lot," she said. "My mum texted me before the race saying my grandparents were going to be here, so it kinda made the race a bit more special and I finished the race for them." A total of 105 swimmers took part in the swim, with a field of 66 solo competitors, seven teams and five duo outfits competing. 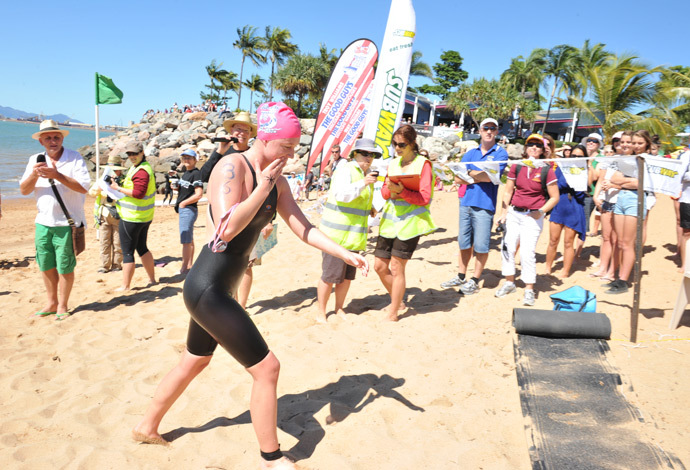 The cold conditions resulted in a handful of swimmers showing signs of hypothermia at the end of the race, and one swimmer had to be pulled from the water roughly two kilometres from the finish. Last year's women's champion Kylee De Rooy and daughter Emily, 11 - plus friends Myar Jones, 12, and Alyssa Koenen, 14 - received a resounding applause when they finished the challenging race. It was the first time all three of the young competitors had ventured into the realm of cageless ocean swimming.